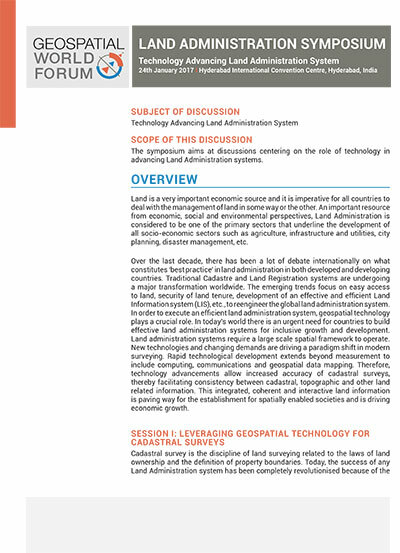 During Geospatial World Forum 2017, Geospatial Media & Communications will organize a one-day symposium on 'Technology advancing Land Administration Systems', on the 24th January 2017, that will aim at discussions centring on geospatial technology for cadastral surveys, securing land tenure and Land Information Systems (LIS). In today's world there is an urgent need for countries to build effective land administration systems for inclusive growth and development. Land administration systems require a large scale spatial framework to operate. Technology advancements allow increased accuracy of cadastral surveys, thereby facilitating consistency between cadastral, topographic and other land related information. This integrated, coherent and interactive land information is paving way for the establishment for spatially enabled societies and is driving economic growth. The session aims to connect stakeholders of land administration with technology to build a strong technology focussed land records system. To highlight and document the best practices of geospatial technologies for land administration across the globe. Cadastral survey is the discipline of land surveying relating to the laws of land ownership and the definition of property boundaries. The emerging new geospatial technologies (GPS and satellite imageries) have bought revolutionary changes in the field of cadastral surveying proving to be a boon in the field of cadastral mapping with high accuracy, cost effectiveness and time efficient manner. The session will deliberate on the adoption of key geospatial technologies and their role in cadastral surveys. The discussion will be centred on the changing technologies, their benefits and challenges. Security of land tenure is a critical component for sustainable urban development. In most countries, especially, developing countries, ownership records are often non-existent or in state of disarray and budget for creating new registry, cadastre and tax databases may be lacking. However geospatial technologies like GPS surveying, mobile GIS, web based GIS, photogrammetry, etc. together with a well-established land policy, play a unified role in securing land tenure. This session will involve a discussion around successful application and role and relevance of geospatial technologies to secure land tenure. Also will be discussed frameworks that can be taken to maximise the uptake of these technologies. A Land Information System (LIS) aims to provide current and detailed geospatial information of the status and development of land cover and land use. Land Information System (LIS) as a decision making tool yields benefits for various verticals on the economies, such as agriculture, utilities, infrastructure development, etc., sectors, which drive an economy's growth. All well developed economies have a well-developed land administration system. This session will involve presentations by stakeholders from industry verticals on the application of Land Information Systems, potential benefits that can be derived for the development of the economy.